Rajasthan has various options for trekking. You can choose the short and easy trekking routes or you may go for the long excursions that will enable you to explore the rich flora and fauna of the state. Several areas in the terrains of Aravali are ideal for trekking. The experience of roaming through the thick forests and moving up to the clear skies is quite thrilling. Polo, regarded as an elite sport, has been popular in Rajasthan for a long time. Out of the two, horse polo and camel polo, horse polo is more of a serious sport. The sport is played by the professionals with pedigree horses. Camel polo is meant for providing amusement. The sport of camel polo is quite new to the state. Ballooning buffs can enjoy a hot air balloon ride. You can cover short or long distances. You may even choose to coast over the vibrant fairs. As Rajasthan is spread out over the Thar Desert and has mountains as well as valleys, ballooning here is thrilling. Another facet that makes your holiday in Rajasthan even more exciting is para-sailing. 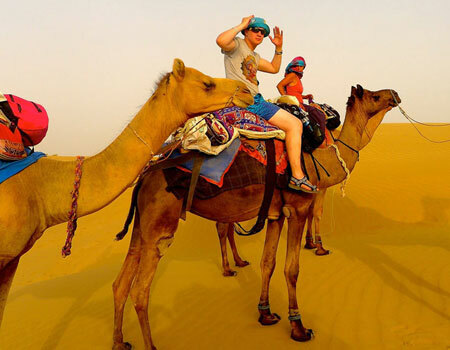 Para-sailing through the wind over the vast sandy desert is an enthralling experience. Rajasthan offers remarkable gliding opportunities. With prior permission from the civil aviation authorities, gliding holidays can be arranged in cities like Jaipur, Udaipur, Kota, Jaisalmer and Jodhpur. Though desert is an unusual area for a sport like golf, several golf courses were made because of the craze of the sport amongst the elite class. A big golf course with 18 holes is laid out in Jaipur. Rajputs always had a passion for flying kites. The sport is seriously practiced in various clubs present in different cities. The craze increases during the international kite flying festival held in Jaipur. For complete enjoyment buy some kites and join the Rajasthanis as well as scores of people who come especially for kite flying from abroad. Bicycling is not only the best but the cheapest way to roam about in the crowded streets of Rajasthan. Exploring the various facets of the state on a bicycle is quite refreshing and relaxing. Large lakes present in Rajasthan allow the locals as well as the tourists to indulge in water sports such as angling, swimming and boating. Though opportunities are available, they are quite limited. Rajasthan has a lot to offer for the wildlife enthusiasts as well with several world famous National Parks and wildlife sanctuaries.